Amidst speculation of a leadership change while BJP celebrates its silver jubilee next week, senior office bearers of the BJP are keen to present a picture of normalcy. Former Prime Minister Atal Behari Vajpayee turned 81 today. He was greeted by a large number of party leaders and activists at his residence here. After 20 years when the first criminal case was lodged against him in 1985, the police is finally preparing a dossier on the criminal antecedents of controversial RJD MP Mohammad Shahabuddin, who, perhaps, best personifies criminalisation of Indian politics. After leading a coalition government at the Centre for the past 18 months, there is now a creeping realisation in the Congress that the party’s political space is gradually shrinking and that it needs to strengthen itself to regain lost ground. Prime Minister Manmohan Singh today expressed sorrow over the demise of former Assam Chief Minister Sarat Chandra Sinha. Two teenage girls were badly burnt when a man known to them for years threw acid on them on Friday. Both girls — Sadhna Pal and Laxmi — are under treatment at a private nursing home with burns on their faces and arms. Four personnel of the Railway Protection Force were killed and several injured when Maoists attacked a train in Vizianagaram district in Andhra Pradesh this afternoon. The Mumbai police has arrested a 30-year-old woman, Laxmi, working as a maid at Lokhandwala Complex in suburban Andheri on suspicion of throwing boiling oil on her employers. Popular actress of yesteryear Dr Bhanumathi Ramakrishna, who strode like a colossus in the Tamil and Telugu cinema for nearly six decades and was gifted with a golden voice, died here after a prolonged illness last night. Chennai hospital develops new micro needle for eye surgery. Shah Rukh Khan sizzles at charity show. The proceedings will be kicked off by a two-day national executive meeting followed by a three-day silver jubilee national convention. BJP general secretary Promod Mahajan insisted there would be neither a “resignation or coronation” during the five-day event even as party leaders told off the record that party President L.K. Advani would resign from his post on December 31, shortly after the convention. The idea is to have his successor take over from him on New Year’s Day. However Rajnath Singh, who is tipped to succeed Mr Advani ,insists that he has not been sounded out for the top job in the BJP. Officially, the BJP’s national executive will hold discussions on political, economic, and foreign affairs issues before the country, including the impact of liberalization and globalization on Indian politics. “We will discuss the party’s performance in Gujarat and Bihar and also our strategy in the forthcoming Assembly polls in Pondicherry, West Bengal, Tamil Nadu, Kerala and Assam,” party spokesperson Praksh Jawdekar said. The party national executive will begin tomorrow afternoon with the inaugural address by Mr Advani and wind up with closing remarks from former Prime Minister Atal Bihari Vajpayee on December 27. The three-day party convention will be kicked off from December 28 and will include a public meeting at Shivaji Park on December 29, which will be addressed by Advani and Vajpayee. Mr Jawdekar announced the party’s MPs, who were suspended from Parliament after being caught taking bribes on camera, would not attend the meeting. Outgoing BJP president L.K. 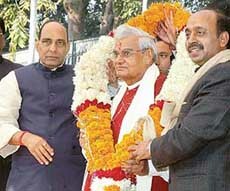 Advani and former Uttar Pradesh Chief Minister Rajnath Singh, who is tipped to succeed him, were among the first to greet Mr Vajpayee. Mr Advani, accompanied by wife Kamala, arrived at the former Prime Minister’s residence at around 10 a.m. and left after 10 minutes. Several senior BJP leaders, including Mr Murli Manohar Joshi, Mr Vijay Kumar Malhotra, Mr Ravi Shankar Prasad, Mr Ananth Kumar, Mr B.C. Khanduri, Harsh Vardhan, Mr Madan Lal Khurana, Mr Vijay Goel, Dharmendra Pradhan and Sahib Singh Varma, also greeted Mr Vajpayee, wishing him a long and happy life. Priests and party activists from Uttaranchal performed prayers for the long life of the octogenarian leader. Children from some schools in Delhi also turned up to wish him. Some of them were dressed as Santa Clause. Priests for the long life of the octogenarian leader. Lodged in Bhagalpur jail after his recent arrest in Delhi, the police are preparing the dossier as desired by the Patna High Court. Sources in the police said the Siwan police had been entrusted with the task as 47 cases related to murder, kidnapping, illegal possession of arms, filing a wrong affidavit and recovery of foreign currencies were reportedly registered against him between 1985 and 2005. Shahabuddin is new in Bhagalpur jail, reading books, including those written by Swami Vivekananda. The Chief Judicial Magistrate of Siwan recently rejected a petition filed on behalf of the RJD MP on November 16, seeking his transfer to Siwan jail from Bhagalpur. Siwan is known as his hometurf where he is like an uncrowned Sultan and where he reportedly ran a parallel government. Even though he was away from his native village of Siwan for over two years, he had contested and won the parliamentary elections in 2004 when behind bars. Last time he was released from the Beur jail in Patna in February, after languishing there for 18 months in connection with the murder an activist of CPI(ML). After his release, he reportedly went all out to ensure the formation of an RJD led government in Bihar after the February poll outcome had resulted in a fractured mandate. But he failed to get the magic number for Mr Lalu Prasad. The fugitive MP created a furore in October when he reportedly appeared for a law examination in September from Muzaffapur in Bihar. In October, his name was deleted from the voters list of Siwan on the orders of the Election Commission. Then the Siwan District Magistrate had ordered registration of a sedition case against Shahabuddin following the recovery of “Pakistan-made” cartridges during raids at his house in Pratapur village. After the first case registered against him in 1985, by the time he was elected to the Bihar Assembly as an Independent from the Jiradie assembly seat in 1990, there were reportedly 12 cases against him, including three of murder. He was re-elected to the Assembly in 1995. Shahabuddin was first elected to Parliament in 1996, not as RJD candidate but on the Janata Dal ticket from the Siwan constituency. According to informed sources in the police, the rise of Shahabuddin’s muscle power was largely due to the support he received from sections of minority, as well as upper caste Hindus, mainly landlords, who were protected by him against the movement by the CPI(ML) and other parties demanding land reforms. This concern is likely to be reflected in the party’s political resolution to be adopted at next month’s AICC plenary session at Hyderabad. The resolution, being drafted by a committee headed by senior leader Arjun Singh, will not turn its back on coalition governments, but will be looking at the long-term goal of returning to power on its own. Senior Congress leaders acknowledge that except for Kerala, where a coalition has worked to its advantage, the party has been weakened wherever it opted for partnership with another party. AICC insiders say the party’s support base has either not grown or has been eroded wherever it has opted for coalitions for short-term gain of government formation. They concede that regaining power on its own remains the biggest challenge before the Congress. Having accepted the reality of coalitions, it will be difficult for the party to ignore the sensitivities of its allies as it sets out to put its own house in order. More importantly, it has to devise strategies to revive the party in the crucial states of Bihar and Uttar Pradesh which alone account for 120 Lok Sabha seats. Having conceded space to regional outfits in these two states, the Congress has a long struggle ahead as it is faced with paucity of leaders and a thoroughly weakened organisation. Looking to the future, Congress leaders say the party should also prepare to face anti-incumbency in states like Andhra Pradesh, Bihar, Tamil Nadu and Jharkhand where the party and its allies recorded huge victories in the last Lok Sabha polls and helped the Congress to form the UPA. It is pointed out that future losses in these states can be compensated by winning back Madhya Pradesh, Rajasthan and Chhattisgarh which, it is stated, will only be possible play the role of an effective opposition. AICC insiders said it has also become imperative to give youth their due place in the organisation as the country has undergone a demographic transformation and a large chunk of population is now in the 18-35 year age group. Sinha, 92, died in Guwahati this morning. He is survived by his wife, two sons and three daughters. In his condolence message, the Prime Minister said the nation had lost a great leader who had contributed to the development of Assam during his long and distinguished career in public life. Two teenage girls were badly burnt when a man known to them for years threw acid on them on Friday. Both girls — Sadhna Pal and Laxmi — are under treatment at a private nursing home with burns on their faces and arms. The man has been arrested and is in police custody. An FIR under Section 326, IPC, has been filed against him. Narendra, their neighbour who had been harassing them lately, accosted them. According to the victims, Narendra was angry with them as they had complained to their families regarding his advances. The man, however, claimed that he had an affair with one of the girls and was angry at her for spurning him. During the attack, most of the acid fell on the other girl. The incident occurred at around 12.15 pm at the Kuneru Railway Station on the Andhra-Orissa border. The train was on its way from Vijayawada in coastal Andhra to Rayagada in Orissa. The object of the attack apparently was the cash being carried by the RPF party for salary disbursement. An amount of Rs 13 lakh was looted by the Maoists before they fled the scene. Vizianagaram District Superintendent of Police Bhavana Saxena said the Maoists, numbering about 10, surrounded the train and opened indiscriminate fire, killing four RPF personnel, including a Head Constable and three constables. The injured RPF personnel and civilians were shifted to the government hospital at Parvathipuram for treatment. The police says that the attack was carried out on a tip off. The police said the woman, who joined the employ of Rekha Ramchandani just 20 days ago, committed the act on Thursday afternoon. While the woman and her eight-year-old daughter Kashmira napped in the afternoon, the maid boiled a pan full of groundnut oil and poured it over the two. The maid is suspected of being mentally unstable. The woman and her daughter did not notice the maid committing the act. The maid is believed to have left the house soon after throwing oil on the two. Both mother and daughter have been admitted to a hospital after suffering 35 per cent burns. A chronic diabetic, 81-year-old Bhanumathi had been suffering from related ailments for the last couple of years.